The Lok Sabha (the 15th Lok Sabha) of the Parliament of India has released the report of the Committee on Agriculture (2011-2012) on ‘Cultivation Of Genetically Modified Food Crops – Prospects And Effects’. 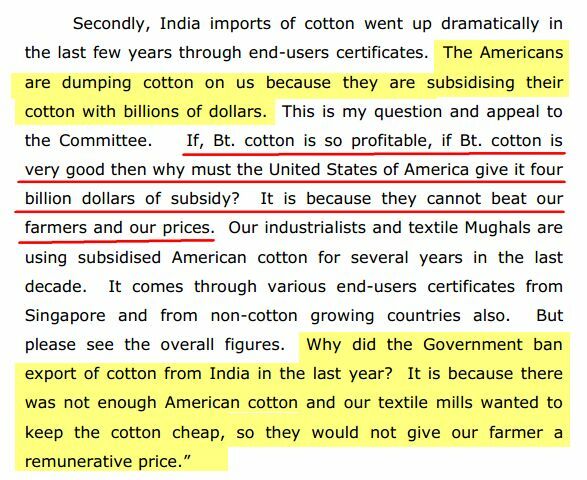 This report was presented to the Lok Sabha on 09 August, 2012. The report stands as a comprehensive indictment of the genetically modified food crops industry and its attempts to wrest control of India’s foodgrain and commercial crops production. The Committee sought views and suggestions on the subject from the various stakeholders and 467 memoranda, most of them signed by several stakeholders were received. In all, the Committee received documents running into 14,826 pages. The Committee also extensively interacted with various stakeholders including state governments, farmers organisations, NGOs, and also with farmers and their families during study visits during this period. Altogether, 50 individuals and organisations gave oral evidence before the Committee. Verbatim records of the proceedings of the oral evidence runs into 863 pages. Conventional biotechnologies, such as breeding techniques, tissue culture, cultivation practices and fermentation are readily accepted and used. Between 1950 and 1980, prior to the development GMOs, modern varieties of wheat may have increased yields up to 33% even in the absence of fertilizer. Even modern biotechnologies used in containment have been widely adopted. For example, the industrial enzyme market reached US$1.5 billion in 2000. Biotechnologies in general have made profound contributions that continue to be relevant to both big and small farmers and are fundamental to capturing any advances derived from modern biotechnologies and related nanotechnologies. For example, plant breeding is fundamental to developing locally adapted plants whether or not they are GMOs. These biotechnologies continue to be widely practiced by farmers because they were developed at the local level of understanding and are supported by local research. o Ability of modern biotechnology to make significant contributions to the resilience of small and subsistence agricultural systems. The pool of evidence of the sustainability and productivity of GMOs in different settings is relatively anecdotal, and the findings from different contexts are variable, allowing proponents and critics to hold entrenched positions about their present and potential value. Some regions report increases in some crops and positive financial returns have been reported for GM cotton in studies including South Africa, Argentina, China, India and Mexico. In contrast, the US and Argentina may have slight yield declines in soybeans, and also for maize in the US. Studies on GMOs have also shown the potential for decreased insecticide use, while others show increasing herbicide use. It is unclear whether detected benefits will extend to most agroecosystems or be sustained in the long term as resistances develop to herbicides and insecticides. Biotechnology in general, and modern biotechnology in particular, creates both costs and benefits, depending on how it is incorporated into societies and ecosystems and whether there is the will to fairly share benefits as well as costs. For example, the use of modern plant varieties has raised grain yields in most parts of the world, but sometimes at the expense of reducing biodiversity or access to traditional foods. Neither costs nor benefits are currently perceived to be equally shared, with the poor tending to receive more of the costs than the benefits. The Committee note with great appreciation the fantastic achievements of India’s farmers and agriculture scientists leading to an almost five times growth in food grains production in the country during last six decades or so. From a paltry 50 million tonnes in 1950 the Country has produced a record 241 million tonnes in 2010-11. In spite of this spectacular achievement that has ensured the food security of the nation, things continue to be bleak on several fronts. Agriculture sector?s contribution to GDP has slid down from 50% in 1950 to a mere 13% now, though the sector continues to provide employment and subsistence to almost 70% of the workforce. The lot of the farmer has worsened with increasing indebtedness, high input costs, far less than remunerative prices for his produce, yield plateau, worsening soil health, continued neglect of the agriculture sector and the farmer by the Government, dependence on rain gods in 60% of cultivated area, even after six and a half decades of Country’s independence, to cite a few. All these factors and many more have aggravated the situation to such an extent that today a most severe agrarian crisis in the history is staring at us. The condition of the farming-Community in the absence of pro-farmer/pro-agriculture policies has become so pitiable that it now sounds unbelievable that the slogan Jai Jawan – Jai Kisan was coined in India. There is, therefore, a pressing need for policies and strategies in agriculture and allied sectors which not only ensure food security of the nation, but are sustainable and have in built deliverable components for the growth and prosperity of the farming community. It is also imperative that while devising such policies and strategies the Government does not lose track of the fact that 70% of our farmers are small and marginal ones. As the second most populous Country in the world, with a growing economy ushering in its wake newer dietary habits and nutrition norms, a shrinking cultivable area, a predominantly rainfed agriculture, the task is indeed enormous. In the considered opinion of the Committee biotechnology holds a lot of promise in fructification of the above-cited goals. Several of conventional bio-technologies viz. plant breeding techniques, tissue-culture, cultivation practices, fermentation, etc. have significantly contributed in making agriculture what it is today. The Committee note that for some years now transgenics or genetical engineering is being put forward as the appropriate technology for taking care of several ills besetting the agriculture sector and the farming community. It is also stated that this technology is environment friendly and, therefore, sustainable. Affordability is another parameter on which policy makers and farming communities world over are being convinced to go for this nascent technology. 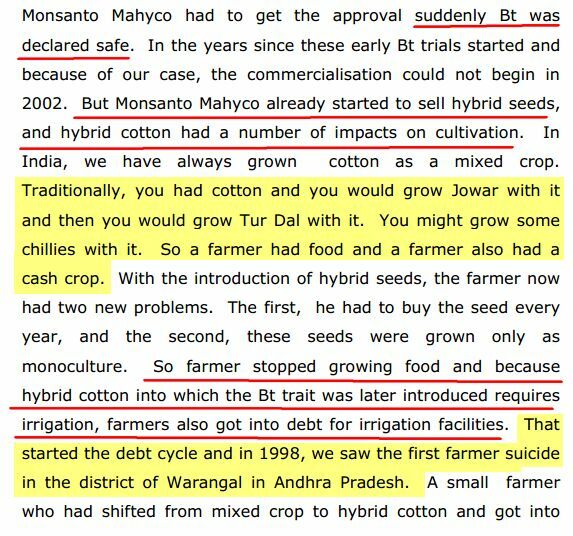 The Committee further note that in India, transgenics in agriculture were introduced exactly a decade back with the commercial cultivation of Bt. Cotton which is a commercial crop. With the introduction of Bt. Cotton, farmers have taken to cotton cultivation in a big way. Accordingly, the area under cotton cultivation in the Country has gone up from 24000 ha in 2002 to 8.4 million ha at present. Apart from production, productivity has also increased with the cultivation of the transgenic cotton. The Committee also take note of the claim of the Government that input costs have also gone down due to cultivation of transgenic cotton as it requires less pesticides, etc. Notwithstanding the claims of the Government, the policy makers and some other stakeholders about the various advantages of transgenics in agriculture sector, the Committee also take note of the various concerns voiced in the International Assessment of Agriculture, Science and Technology for Development Report commissioned by the United Nations about some of the shortcomings and negative aspects of use of transgenics/genetical engineering in the agriculture and allied sectors. The technical, social, legal, economic, cultural and performance related controversies surrounding transgenics in agriculture, as pointed out in IAASTD report, should not be completely overlooked, moreso, when India is a signatory to it. The apprehensions expressed in the report about the sustainability and productivity of GMOs in different settings; the doubts about detected benefits of GMOs extending to most agro-eco systems or sustaining in long term; the conclusion that neither costs nor benefits are currently perceived to be equally shared, with the poor tending to receive more of the costs than benefits all point towards a need for a revisit to the decision of the Government to go for transgenics in agriculture sector. This is all the more necessary in the light of Prime Minister’s exhortion on 3 March, 2010 at the Indian Science Congress about full utilisation of modern biotechnology for ensuring food security but without compromising a bit on safety and regulatory aspects. 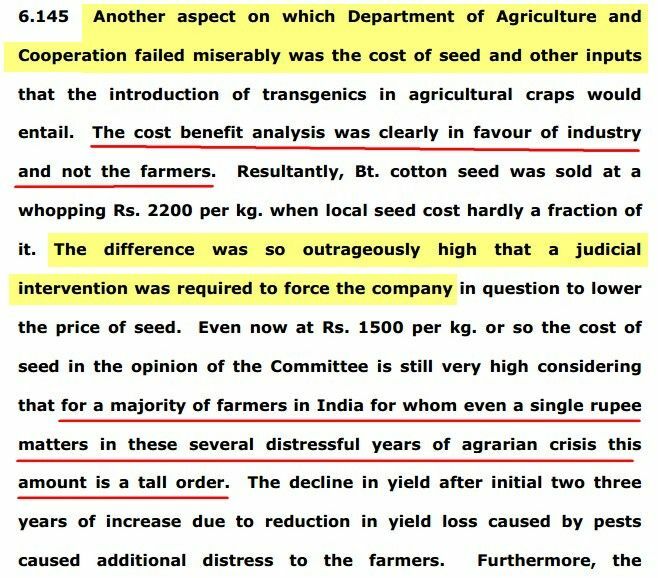 The present examination of the Committee, as the succeeding chapters will bear out, is an objective assessment of the pros and cons of introduction of genetical modification/transgenics in our food crops which happened to be not only the mainstay of our agriculture sector but also the bedrock of our food security.